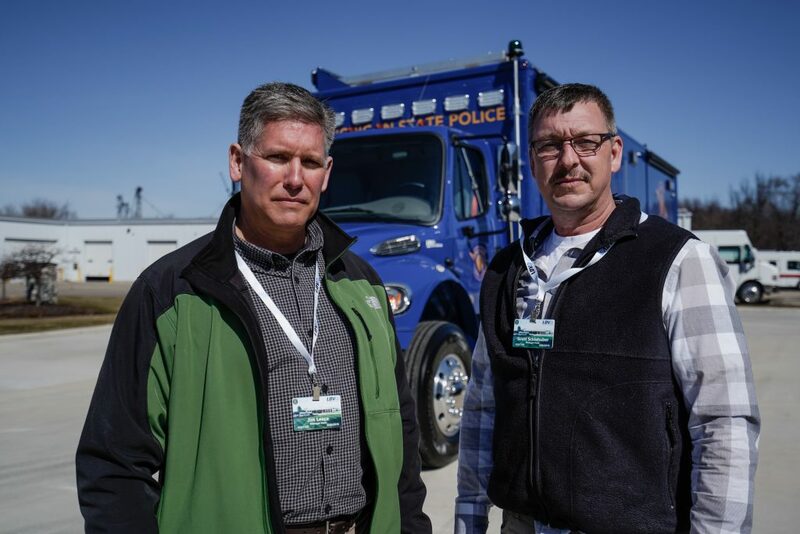 Michigan State Police chose a Freightliner M2 chassis with a 52,500 GVWR for their new mobile command center. The vehicle features three LDV-fabricated flat-floor slide-out rooms and all aluminum body construction. On the outside, the vehicle has a generous weatherproof workstation housing complete with a 55" LED Smart TV, power outlets and CAT6 network jacks. The slide-out rooms feature end windows for additional light. A complete emergency lighting and siren package was installed as well. A pneumatic, telescoping mast with perimeter camera, DirecTV satellite, fully-welded aluminum rooftop raceway and a giant curb-side power awning with windspeed-sensing technology are included. The network and electronics racks are accessible on the outside of the vehicle for serviceability. A giant storage compartment complete with custom fabricated aluminum shelving was integrated into the curb-side rear of the body. Inside the command vehicle, a front conference room area complete with fixed table and seating for six was installed. The chairs are stowable during transport. A touch-screen collaboration monitor is installed at the front of the room. Corner workstations, monitors and a dry erase board round out the room. An additional workstation and galley kitchen were installed in the center area of the vehicle along with two network and electronics racks. Custom aluminum cabinets provide storage. In the rear of the vehicle, additional workstations with solid surface countertops, radio communications, aluminum cabinetry, dual printers and dry erase white boards make the space user-friendly and functional. Dual Intel-I-Touch™ vehicle automation touch screens handle systems control: One installed in the cab area and the other in the working-area of the vehicle. A vehicle leveling system was also integrated. 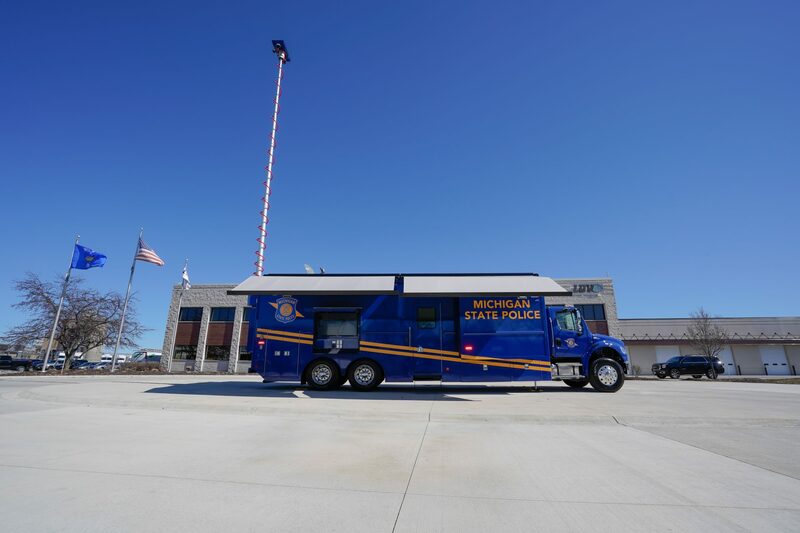 Michigan State Police's new mobile command center is an outstanding example of a modern mobile command vehicle that is easy to set-up and deploy on scene with a great interior layout.